As an alternative to the traditional rotating shutter I've been experimenting with LCTec 50mm diameter LCD "Fast Optical Shutter"
These are at 20Hz(40 breaks/sec). What this translates to is each little bright element is 12.5ms in duration. Interesting results. 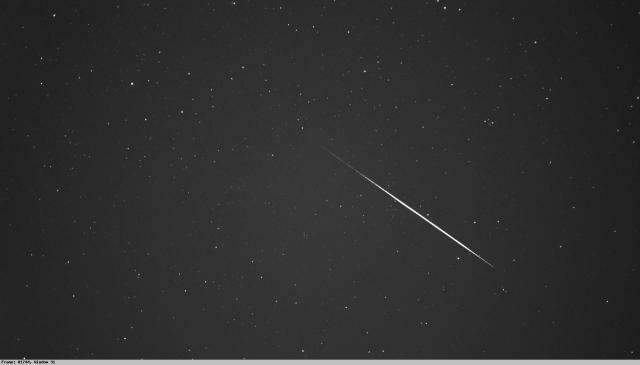 Next thing is to try and graph the meteor trails to see what the light curves are like. ...and now they're back,,,, how odd, don't know what's happening!!! What exposure times did you use Bill? How does one determine the start and end times of the meteor? The exposures were 27 secs at iso1600. 30mm f1.4. In short you can't know. The chopping, in principle, is used to provide accurate meteor duration and precision astrometry allowing meteor velocity and decelerations to be measured. This in turn is used with other observations to produce better orbits. The previous owner of the mechanical system I'm trying to re-instate, the late Steve Evans, wrote a very interesting paper in the BAA journal on precision observations. One of the reasons his shutter system was designed to chop at 60 breaks/sec. I'm having some trouble with vibrations so will need to re-evaluate my design. The advantage of the mechanical shutter is that it is working at 100% efficiency. The shutter blades completely block or not. The LCD shutters have both polarisation issues and the fact that when open are still ~30% opaque (thats ~0.6 of a stop). Any meteor needs to be that much brighter with a LCD cf mechanical. Like everything with meteor astronomy it's all a trade off! I suspect that given the cost and behaviour of the LCD shutter that you are probably better off using the DSLR in video mode. In that case you can get a direct measurement of angular velocity and time from the video stream. I have done analysis of DSLR stills for various events using Astrometrica and it is hard work to get anything really useful from the images. With video it is much easier to extract the path and angular velocity and also much easier to eliminate other things like glinting satellites. This image is a stack from 1/25s video frames. The small gaps in the trail correspond to the very short dead time between exposures of the sensor. I've posted some of the individual frames here. Hi, I use the same basic method with my WATEC's however when you dig into the numbers even 1/25 sec isn't fast enough to get the required precision to determine decelerations for orbital corrections. Steve Evans' paper from 20 years ago (!!!) out lines the requirements nicely. (JBAA Vol 108 4 1998 "Experiments in digital meteor astrometry") His work then was with his rotating shutter system, which I have and am trying to reinstate, running with three blades giving a chopping interval of ~33.3ms that's faster than 1/25 sec (40ms) and it still wasn't enough. He ultimately was working with a 6 blade shutter to give ~16.7ms (Which is the one I've been given). Astrometrica is the program he mentions. The costs are high but not prohibitively so compared to the camera's your using. Even with the cost of a LCD shutter and function generator as they are at the moment is still ~tenth of a SONY A7SII and if you include include a cheap dslr and lens and you'll get five systems for the money. Despite all of the limitations with meteor observing it's all about sky coverage! The consumer technology is quite remarkable. YUK! Hi hopes dashed! Much truth in the expression " you get what you pay for"! By 10Hz things are going down hill. I imagine they'd work after a fashion but the trail would not be as clean as the LCTec FOS. At £2.95 for the 36mm square one and £4.95 for the 48mm x 98mm ( which is actually pretty big), not too expensive an experiment. I'm going to mount the smaller one in front of a camera anyway and see how it goes. Be interesting to see a side by side comparison. All I need is some clear sky, that's the big ask! First pic is the LCTec shutter running at 20Hz. The upper trace is the photodiode output. You can see how it is twice the frequency of the driving signal, lower trace. The second picture is what I reckon is the best performance of the smaller, cheaper shutter. It only has the upper trace. Ignore the frequency on the image, the scope is picking up some of the much higher frequency noise. The drive signal was 6Hz giving 12 breaks/second. Just noticed, 2011, I need to reset my clock!!! Well if they're driven EXACTLY in phase they'll either both be open or both be closed. If driven exactly out of phase it'll look either always open or always closed. If the drive signal is allowed to drift they'll strobe in and out of phase. If that's not what happens then I've no idea!